In making these cultural concepts and frameworks accessible and in discussing how to use them, this edited textbook goes beyond the identification of historical, socio-cultural and political factors and their effects on market outcomes. It builds understanding of the cultural symbols, world views, and practices at the heart of organizations and consumer collectives to better comprehend their relationships in markets. 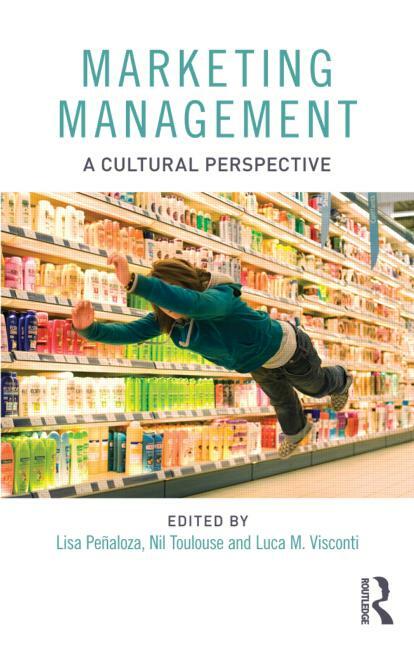 This book highlights the benefits that managers can reap from applying interpretive cultural approaches across the realm of strategic marketing activities including: market segmentation, product and brand positioning, market research, pricing, product development, advertising, and retail distribution, among others. With global contributions grounded in the authors’ primary research with companies such as General Motors, Camper, Prada, Mama Shelter, Kjaer Group, Hom, and the Twilight Community, this edited volume delivers a truly innovative marketing textbook. Marketing Management: A Cultural Perspective brings a timely and relevant learning resource to marketing students, lecturers, and managers across the world. Lisa Peñaloza is Professor of Marketing at EDHEC Business School, Lille, France. Her work exploring interpellations of cultural meanings and economic valuation in credit/debt, migration, community formation, and retailing is published in the Journal of Consumer Research, Journal of Marketing and Consumption, Markets and Culture. Nil Toulouse is Professor of Marketing at the Université Lille Nord de France and Skema Business School, France. Nil’s research on sustainability, consumer ethics, immigration and fair trade appears in over 20 articles and chapters in periodicals and books, including the Journal of Macromarketing, Journal of Business Research, and Journal of Business Ethics. Luca M. Visconti is Associate Professor of Marketing at ESCP Europe, Paris. His work appears in books and journals, including the Journal of Consumer Research, Journal of Advertising, Industrial Marketing Management, Journal of Business Research, Journal of Consumer Culture, and Consumption, Markets and Culture.